The Rosette Nebula is an emission nebula, a large star forming region located in the constellation Monoceros. The nebula is a large cloud of gas and dust that lies near a large molecular cloud and is closely associated with the open cluster NGC2244, whose stars were formed from the nebula’s matter in the last five million years. The Rosette Nebula and the cluster are about 130 light years in diameter and are approximately 5,200 light years distant from Earth. The two brightest stars in NGC2244 are about 400,000 times more luminous than the Sun and roughly 50 times more massive. They emit large amounts of radiation and generate a strong stellar wind. As a result, the cooler stars that lie in the vicinity, are in danger of having their potential planets destroyed and planet-forming dust and gas blown away. 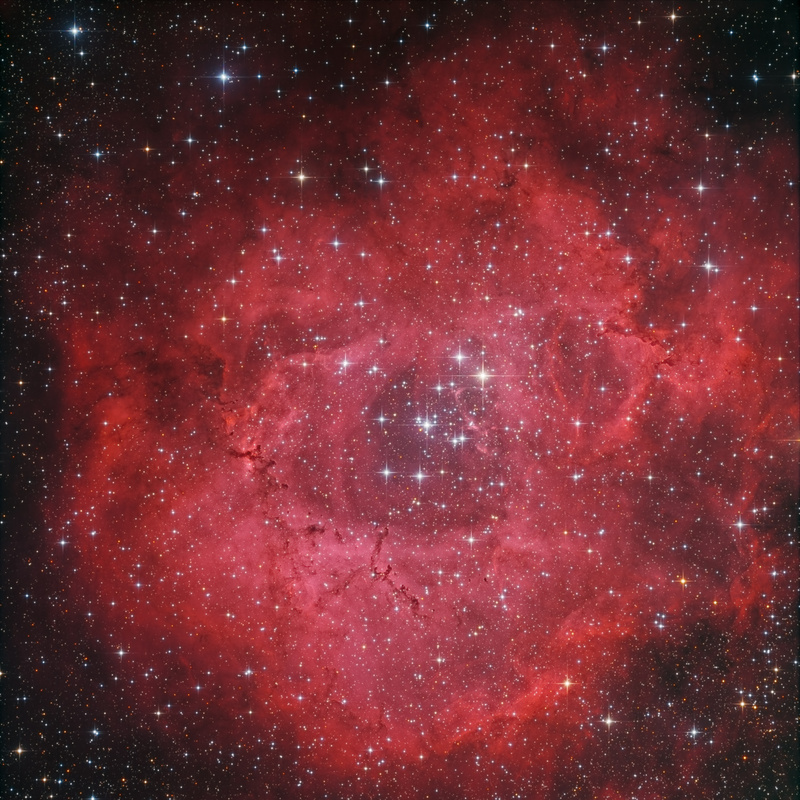 The hot stars in the NGC2244 cluster are also responsible for the central hole in the Rosette Nebula. The hole is a result of the stars’ radiation blasting away the gas.